Available from IDEC , the EB3C series of relay barriers provides an alternative to Intrinsic Safety Barriers. Intrinsic safety barriers are designed to control voltage, current and total energy distributed to actuator instruments and sensors in unsafe environments. Voltage regulators can ultimately assist in the prevention of explosions and possible fires. 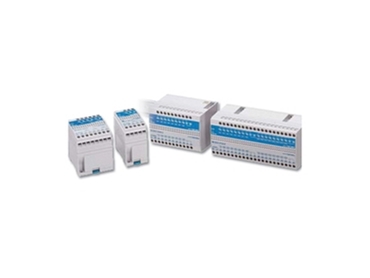 EB3C relay barriers are supplied in 100-240VAC or 24VDC and feature 1 to 16 channels. The EB3C series of relay barriers has numerous options to meet specific customer applications as required. EB3C relay barriers are fully EC60079 compliant, have a universal AC power voltage (100 to 240V AC) and do not need grounding. Dry-contact switches with 0.5Ω maximum contact resistance can be attached to EB3C relay barriers and the 8- and 16- circuit types are supplied in common wiring types, making them ideal for connection to PLCs. EB3C relay barriers can be installed by way of 35mm wide DIN rail mounting or direct panel mounting, while IDEC’s original spring-up terminals minimise wiring time. Further information on EB3C relay barriers is available from IDEC.